As the chillier months of autumn and winter loom large ahead of us, many start wondering: What is the best portable garage heater? A high quality heater is a great way to keep your workshop warm during the fast-approaching colder seasons of the year. In order to help you find the one that’s the best fit for your workspace and budget, we have reviewed several different models based on quality versus value. Portable Garage Heater Comparison Chart. 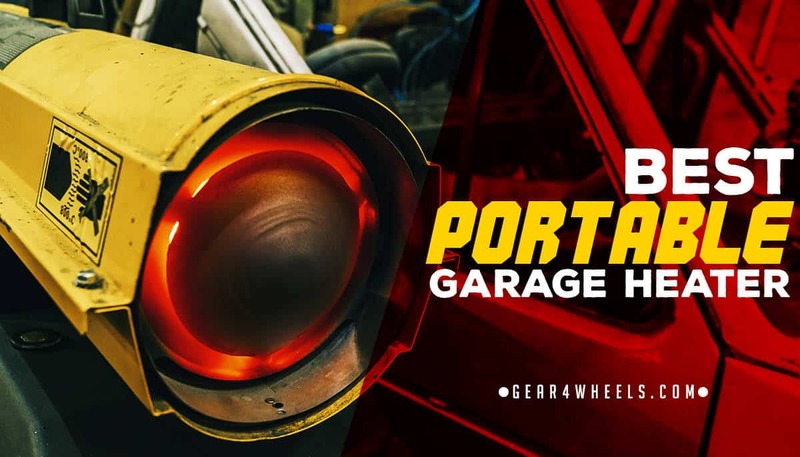 This 5,000-watt garage heater isn’t called The Hot One for nothing. Unless you have a truly massive garage, this compact heater can keep your workspace as warm as you need it all winter long. Take a look at what’s good and bad about this compact powerhouse from Cadet. Safety Considerations: Automatic thermal cutoff, UL listed, fan delay for startup and shutdown to distribute heat more efficiently, built in wall mount or floor stand. This powerful electric heater warms areas up to 600 square feet, and it has a self-blower and thermostat so that it doesn’t use up any more electricity than it has to. All you need to do to install it is plug it into 240-volts like your washer or dryer, and turn it on. The blower fan waits until the heating element has had a chance to warm up before kicking on, which is easier on the unit overall and warms your workspace faster, and when you shut it off, the blower keeps going to dissipate the heat more efficiently and preserve the heating elements. You will need to have access in your workspace to a 240-volt outlet to power this unit, as it does not work on US standard 120-volt outlets and cannot be plugged into anything else. You will need to have a certified electrician install a 240-volt outlet if you don’t have one in your garage already, or if you don’t know how to set up that connection on your home electrical lines. Dura Heat’s super heater for workshops and large workspaces needs room for fuel exhaust and should not be used in spaces where airflow is confined, but if you need to warm up a job site or large workshop, this is the heater to get. Ease of Installation: Plugs into 120V, can run on fuel oil, kerosene, diesel, aircraft fuel, and jet fuel. This is a multi-fuel device, which means as long as you have access to kerosene, #1 or #2 fuel oil, diesel, JP-8, or Jet-A fuels, you have tremendous heat within 1800 square feet. It’s a bit impractical for smaller job sites and workspaces, but it will keep you and your crew toasty all winter long on days when the weather is bitter cold. It does need access to 120V power to operate properly, but that is more to run the ignition efficiently than anything else. Common question is: How safe are these? Users/Owners need to make sure the fuel tank is completely empty before attempting to move this heater from site to site. It should never be transported while the fuel tank is full, and it is essential to only refill the fuel tank if you intend to run it dry again before moving this heater. Failure to follow these safety instructions could result in a serious injury or death due to fire hazards or uncontrolled combustion of the fuel. Cadet’s lower-power model of The Hot One for smaller workspaces, this model is more energy efficient and can be set on flat surfaces or wall mounted. Here’s what we love about this model. This can keep smaller garages and workshops warm all winter long with less energy usage. It runs reliably for hours at a time, and has numerous built-in safety features to keep it from becoming a fire hazard when you run it for long periods of time during the colder months of the year. As with Cadet’s more powerful 5,000-watt model, this unit needs a 240-volt, 20-amp outlet to run. It will not work or even plug in to a standard 110-120-volt household electrical outlet. That means unless you know how to safely install a 240-volt outlet, you will need to have one professionally installed by a professional electrician to use this in your shop. For those that need to efficiently heat a small to medium sized space without electricity, Mr. Heater has you covered with their Big Buddy model. This unit made our top list of the very best garage heaters to buy, so definitely worth checking. This little heater runs on propane and can generate 18,000 BTUs. I’d say that about covers it for most folks. Ease of Installation: Connect it to a standard propane tank (not included), and fire it up. All you need is a standard tank of propane (like you would use for a gas grill or camp stove), and you can safely and easily warm your workshop or garage for hours on end with this handy portable heater. It has dual-ceramic heating plates for durability and efficiency, and the reflector plate and blower (battery powered for true portability) distribute the heat effectively throughout your 400 square foot workspace. Best of all, with a built in oxygen sensor to control the pilot light and an auto-off feature if the heater tips over both make it one of the safest heaters to operate in an enclosed space like a garage or workshop. Ummmm...you need a propane tank and 6 D-size batteries? For most people who would have a need for a garage or workshop heater, those aren’t really obstacles, but it does bear mentioning. You can also purchase a 6-volt DC/AC adapter to run the fan off of a standard electrical outlet if necessary too, though it does not come with said adapter. That’s really all the negative things I can say about this heater. The Big Buddy’s little brother called the Portable Buddy, this propane heater is great for smaller enclosed spaces where a blower isn’t necessary. It’s got an easy carry handle that folds over, and it works great even in places with no electricity. Here’s what there is to love about this small propane heater. You’ve got to love a portable heater that you can take anywhere. A hunting cabin, the garage, ice fishing, it doesn’t matter to the Portable Buddy. Just pop a can of camp stove propane on the swivel connector and start it up. The dual ceramic heating elements generate a lot of warmth, and the reflector panels make sure the heat circulates out into the room nicely. It’s also got the safety features you want in a portable heater that will be used in an enclosed space where the potential for lack of airflow or getting knocked over is higher than usual. If you haven’t got propane on hand, you don’t have a working heater. That is really the only disadvantage to this portable heater. It’s a compact and effective workspace heating solution. The best overall value out of these five models is absolutely the Mr. Heater MH18B Big Buddy. It’s not too cumbersome to load up in a car or truck for a weekend at a hunting cabin, it runs on full size or campstove propane tanks, it’s got a battery powered blower for heating larger spaces, and it generates more than enough heat to keep a workshop or garage warm for hours at a time without worrying about it giving out. It’s also got some of the best safety features of any portable propane heater on the market. If you need a good portable space heater for your garage or workshop, definitely give the Mr. Heater Big Buddy a first look.